Hollywood had its Barrymores. Community theater has its Cramers. For its opening night of “Gypsy,” Waukesha Civic Theatre put on parade three talented members of the Cramer family. Most notably, Kelli Cramer played the role of Rose Hovick, the overbearing stage mother of two, including the striptease artist Gypsy Rose Lee. This is a tour de force performance, elevating the show to about as close to professional quality as community theater can get. Playing alongside Kelli Cramer is her husband John Cramer, managing artistic director of WCT, who also directed the show with Mark Schuster’s assistance. Both Kelli and John are members of the Actors Equity Association, the union representing theatrical performers. It is a rarity to have such accomplished thespians on a community theater stage. Last spring, the Cramers’ daughter, Elena, starred in “Annie Get Your Gun.” After seeing her mother perform, it is evident the acorn doesn’t fall far from the tree. Impressive in smaller roles in “Gypsy” was the Cramers’ son, Jude. This is a huge cast, with good performances from top to bottom, an outstanding set and lighting, and crisp, clear sound for the story and Stephen Sondheim’s lyrics. Anne Van Deusen is music director. I was thrilled to see something I’ve been hoping for at WCT for years – the orchestra, directed by Jim Van Deusen, was on the stage, providing up close sound for Jules Styne’s memorable music. “Gypsy” is set in the 1920s, the waning days of vaudeville, on the cusp of the Depression. Single mom and three-time married Rose is trying desperately to get her daughters, particularly the cute, blonde June, into show business. She meets Herbie, a one-time talent agent turned candy salesman. Rose likes Herbie – and vice versa – and she asks if he’d represent her daughters’ act. She dreams up acts for her girls, which include adding four boys and a dancing cow. The girls continue their girlish routines, even when they move into young adulthood. In a very slick scene, the young performers morph into their more mature counterparts while dancing in a patriotic skit. Strobe lights flicker while the older performers replace the younger. Really nicely done. But while times are changing, Rose’s show doesn’t. Several disgruntled performers bail, including daughter June, who runs off with one of the boys in the show. Rose sets her sights on daughter Louise, who was happy to let her sister take the spotlight and is reluctant to be the star. Louise, however, begins to warm to the idea of her new “family” consisting of her mother, Herbie and a small troupe as they sing a joyous “Together Wherever We Go.” But the pickings for performances are slim. Herbie finally finds a gig, but doesn’t realize it’s part of a burlesque show, which Rose vowed she’d never do. Once more, Rose sees a way to use her daughter’s skills, but the tradeoff is huge. Louise, who takes the name Gypsy Rose Lee, goes on to stardom, and a life without her mother’s influence. Everything about Kelli Cramer’s Rose is superb. She caresses, rather than belts, the lyrics “Everything’s coming up roses” and you feel her hopefulness. She hangs on to the “ms” in hum-drum in “Some People,” and you feel her distain for an ordinary life. She mutters hilarious asides under her breath, to great comic effect. Her emotions are raw in “Rose’s Turn,” in which she mulls her desire for stardom. Musically, she hits every note with strength and nuanced emotion. John Cramer allows his Herbie to step aside and let Rose rule. Their “Small World” scene, in which they discuss their common ground, is sweet and tender. The pacing is perfect, with just the right awkward pauses that only veteran performers can pull off. As Louise, Megan Miller has a lot of territory emotionally to cover, and does it well. With slumped shoulders and quiet obedience, she plays the once passed over daughter reluctantly thrust into the spotlight. Like a butterfly struggling out of a cocoon, her transformation into a confident star is something to see. Miller and Carolann Grzybowski, who plays a marvelous June, pair up for a charming “If Momma Were Married,” although Miller seemed somewhat overpowering in that number. Another wonderful scene featured Benjamin Johnson, who fashioned another entertaining performance after a starring role in Sunset’s “Anything Goes.” His Tulsa character sways gracefully like a tree in the breeze, sliding and gliding with fluid dance moves. He and Jude Cramer, Santana Vannarath and Alexander Vrba do some great tap dancing in their tuxes, one of several nicely choreographed scenes by John Cramer. (Another featured the whole cast tap dancing during curtain call). The burlesque strippers played by Jenny Kosek, Logan Jarecki and Carrie Gray have great fun with “You Gotta Get a Gimmick” as they give Louise a lesson in striptease. It’s always a funny scene and could have been camped up even more. 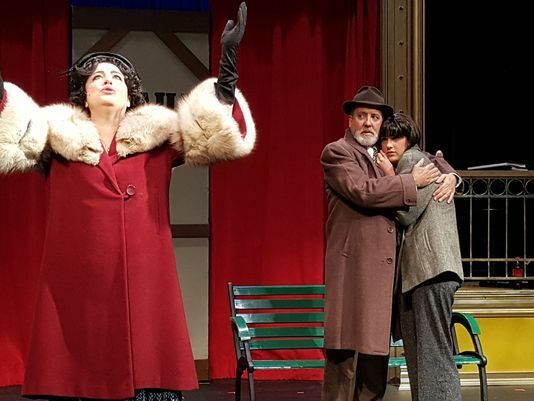 “Gypsy” is a great start for WCT’s 60th season, showcasing the considerable talents of the area’s First Family of Community Theater and many others.